Entry in the Confederation Series shows John A. Macdonald as the indispensable politician who brought allies and enemies alike to establish Confederation. OTTAWA, June 22, 2017 – The Macdonald-Laurier Institute is pleased to showcase the fifth paper of its Confederation Series, written by Munk Senior Fellow Alastair Gillespie. This paper is introduced by Peter MacKay, the final leader of the Progressive Conservative Party of Canada, and former Deputy Leader of its successor, the Conservative Party of Canada. This paper examines John A. Macdonald’s role as the indispensable politician who made Confederation possible. Many had dreamed of Confederation, others had long fought for constitutional reform, but only the resourceful Macdonald managed to achieve it through an extraordinary coalition deal – making his record an elegant defence of the importance of good practical politics in delivering real change. To read the full paper, titled “Sir John A. Macdonald: The Indispensable Politician,” click here. Long resisting demands for constitutional change, Macdonald employed a subtle and distinctive political strategy to deliver confederation. Calling the constitution a “national, by no means a party question,” likening it to the British Parliament’s abolition of the slave trade, Macdonald called for constitutional issues to be debated on their merits, and for change to come only when the issue was “ripe.” As the Gillespie comments, this “Burkean strategy of a youthful ‘Old Tomorrow’” ultimately delivered Canada’s new constitution. Even before Confederation, Macdonald shaped Canada’s national character by resisting extremism and establishing a brand of moderate government that has endured. In partnership with his great political friend George-Etienne Cartier, they governed Canada together, practising the politics of the whole. In the Confederation debates of 1865, Macdonald called for French-Canadians to be treated “as a nation,” commenting that Canada for many years had already had “a federal union in fact,” if not in name. Relating the famous (and often personal) antagonism between Macdonald and George Brown, his long-standing political opponent in Upper Canada, ultimately the paper recounts the Great Coalition of 1864, joining Reformers and Conservatives to deliver Confederation together. For some years Brown had offered to support any government pledged to constitutional change – it was Macdonald’s supreme accomplishment to accept the offer, and to make Confederation practical politics for the first time. To support the Confederation Series, MLI established The Confederation Project, an online resource to publish and collect the speeches featured in the papers. 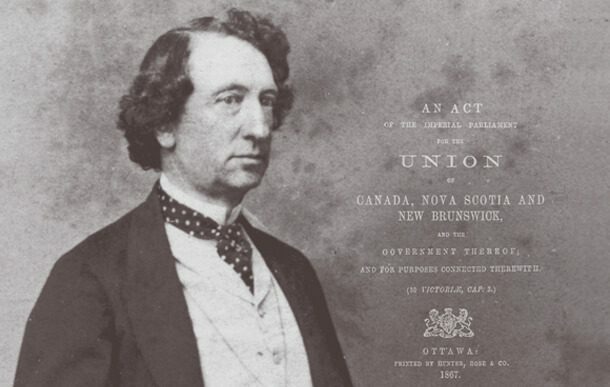 John A. Macdonald’s speech in the Confederation Debates can be downloaded here. Other speeches, together with the previous four papers in the Confederation Series, are available on the Confederation Project webpage, with additional items to be released in coming weeks.